This dietary supplement helps the normal functions of urinary excretion. 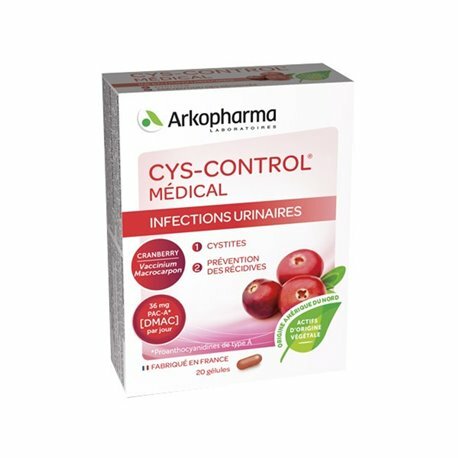 Cys-Control Laboratories Arkopharma is a dietary supplement for people experiencing urinary discomfort, and desiring to improve their balance and urinary system. Indeed, this dietary supplement provides 36 mg of proanthocyanidins (PAC) per day. Daily consumption of 36 mg of proanthocyanidins helps reduce the adhesion of certain E. coli bacteria to the urinary tract walls (According AFSSA, French Agency for Food Safety. Apr. 6, 04). Helps maintain a healthy urinary system. 2 capsules per day with a large glass of water and taken before 2 main meals or 2 hours after eating. If urinary discomfort, duration of use is usually 10 days. To help prevent recurrence, it is advisable to use Cys-Control for 20 days. Drink plenty of fluids throughout the day, a minimum of one and a half liters of water. Powders and berry extract Cranberry (Vaccinium macrocarpon, Magnesium Hydroxide, Maltodextrin wheat, gum arabic) (400 mg per capsule) rich in proanthocyanidins, Hydroxypropylmethylcellulose, Anti-caking agents: silicon dioxide, magnesium stearate. Shell: gelatin, Dyes: iron oxide, titanium dioxide. used as substitutes for a varied and balanced diet. Consult your pharmacist or your doctor. Urinary tract infections in children under 12 years must be supported by a doctor beforehand. If urinary tract infection, Cys-control capsules does not replace antibiotic treatment. If symptoms persist beyond 48 hours, a doctor should be consulted. Prolonged cranberry in subjects individuals to kidney stones consumption is discouraged. In case of treatment with anticoagulants class of anti-vitamin K, should avoid taking Cys-control capsules or consult a doctor. Cys-control capsules is not recommended in patients with hypersensitivity to any component. Do not hesitate to ask your doctor or pharmacist if you experience side effects. Keep out of reach of children. Cys-control capsules can be used by diabetics, pregnant women and nursing mothers. Using Cys-control capsules does not modify the results of urinalysis cytobacteriological (ECBU). Read the instructions on the package leaflet before use. This medical device is a product of regulated health door, under this regulation, the CE marking. Keep a physical activity regularly and drink at least 1.5 liters of water per day (mineralized water). Increase your intake of nuts, oilseeds unroasted and unsalted, blue oily fish (checking their origin! ), Seafood, pulses, cereals, fruits and vegetables in general. Ensure a regular intake without excess calcium-rich dairy products: dry cheeses, yoghurts, fresh cheeses. Nearly one in two women experience urinary discomfort during her life. In men, this usually happens after 50 years. Vaginal dryness, urinary incontinence, pain ... The genitourinary syndrome occurs after menopause in nearly half of women. Discover our new range of essential oils to promote urinary comfort , food supplements for intimate comfort , fluid extracts of Standard Plants for urinary antiseptics.